Looking to give a gift from the kitchen this year? Try a recipe from the man who gifted us with the creation of the Food Network, longtime Arizona resident Jack Clifford. Jack’s Refrigerated Bread and Butter Pickles just made it on my short list of new favorite culinary gifts because they are about the tastiest sweet pickles I’ve ever munched and crunched on. But you won’t find this recipe in his new book. He’s sharing it for the first time in this column. Jack’s remarkable career includes launching a student radio station in Michigan, becoming KTVK Channel 3’s first sports anchor, a past president and general manager of Channel 12, and eventually the creator of the Food Network. It’s all chronicled in his new book, The Least Likely To Succeed, detailing Jack’s journey from bottom of the class to top of the business world, and is filled with behind the scenes stories from friends and colleagues like Walter Cronkite, Ted Turner and Robin Leach, the very first Food Network star. Despite the book’s title, Jack found the recipe for success over and over again–in business, and in the kitchen. That’s where he developed a passion for all kinds of foods including bread and butter chips. Here’s how he explains his quest for pickle perfection: “I’ve been a pickle aficionado all of my life. Searching for the perfect combination of ingredients, I finally tweaked everything to just the right balance of sweet and sour. They are always a hit at parties and everyone is always impressed with the homemade touch. 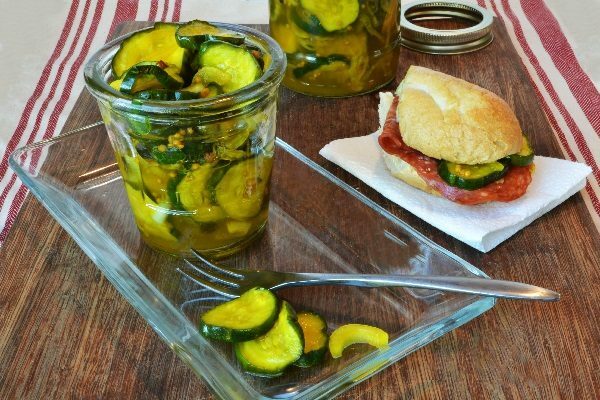 What everyone really doesn’t know is how very simple it is to make these pickles at home. They are delicious and so crisp!” Agreed, Jack. They’re absolutely pickle-icious! The Least Likely To Succeed is available on Amazon.com. It can be ordered at Changing Hands Bookstores in Phoenix and is also available on Kindle and Nook. In a large saucepan, add sugar, vinegar, salt, pickling spice, mustard seeds and turmeric. Stir to combine then bring to a rolling boil. Turn heat to simmer, cover and cook for 10 minutes. Remove pan from heat and let cool completely. Wash and slice cucumbers crosswise into 1/2 inch rounds for chips or lengthwise for spears. Place chips or spears and sliced onion into one 6-cup mason jar or two 3-cup mason jars. (Make sure jars are clean but not necessary to sterilize.) Pour cooled pickling marinade over pickles. Firmly pack pickles into the jar allowing 1/2 inch of pickling juice at the top. Seal jars and refrigerator for 48 hours. After opening, they will last 3 months.